Which creature has 21 limbs? Who would win — Godzilla or a T.Rex? Which two elements were combined to form the name of a lighting company? “What Color is the Sun? : Mind-Bending Science Facts in the Solar System’s Brightest Quiz” is written by Brian Cleggs, author of many articles and books on science. This book is a collection of popular questions on science. 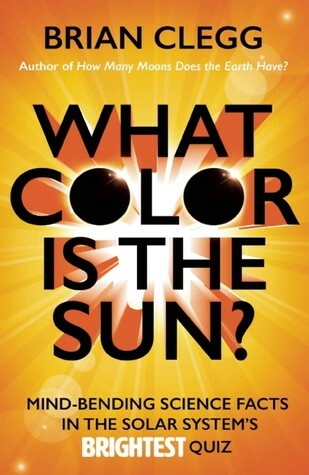 “What Color is the Sun?” is structured in a quiz format. There are enough questions for 2 quizzes with 6 ordinary rounds and 2 specials rounds. Each round is thematic (Mathematics, Science Fiction etc.) and has eight questions in it. Every question has a bunch of associated facts in addition to page long explanation. The book can be used solo or for an actual quiz. Most of the questions are quite interesting. Their solutions and associated facts are well explained and will keep a reader occupied. In addition, the variety of subjects makes this book interesting. I did not find any obvious mistakes either. “The Color of the Sun” is a decent book on science. It reminds me of the books I used to read when I a kid and so I have sneaking nostalgic affection for it. This will be a good time pass on an airplane or in a nerd party.